What exactly is it in hair that determines if it will be curly or not? 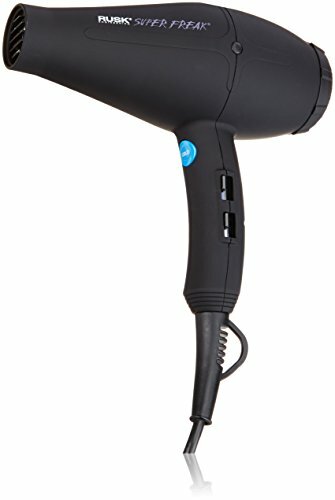 What characteristics make a hair dryer great for use on curly hair? Are you tired of dealing with unruly curly hair that also seems to take forever to dry? It’s true that curly hair can be difficult to dry and even more difficult to style because of its chemical makeup. It has strong disulfide bonds which resist straightening and other shaping you try to do with your curly type hair. Fortunately, heat is your friend when it comes to breaking down these strong disulfide bonds. That is why the best hair dryer for curly hair is so effective at drying and styling it. In this article, we will quickly review six of the top hair dryers for curly hair. We will also give you information on what to look for when buying a hair dryer to use on your curly hair and give you more information on curly hair in general. Speed Settings : Air speeds up to 1500 liters per hour. One of the best ways to get your curly hair to behave is to buy a hair dryer that has a lot of Italian engineering built into it. That is exactly what you get with the Elchim Classic 2001 Dryer. It has an Italian designed motor that is powered by 1875 watts and runs very quietly too. The high heat it produces is very effective at drying and reshaping curly hair. Among its best features are its 9-foot long power cord, 40 feet per second airflow and the 7 different heat and speed combinations it has. The thin nose design of it helps naturally concentrate the air stream coming from it too. The Elchim Classic 2001 Dryer uses a simple no-nonsense approach to hair drying and styling that has made it one of the most popular salon hair dryers in the world. 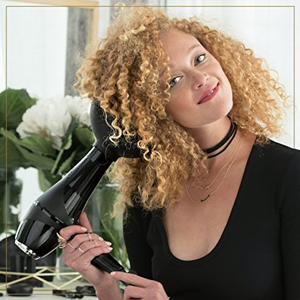 If you want to tame your curly hair when drying and styling it you need a hair dryer that isjam-packed with great features that enhance its ability to reshape curly hair. That is where this hair dryer comes into play. The Solano Supersolano 3700 Moda Professional Hair Dryer has 1875 watts of heat and air power to help you dry and style even the most stubborn curly hair. High heat is not the only way this hair dryer helps you manage your curly hair either. You can also rely on its outstanding titanium/ceramic heater coatings which enable this hair dryer to heat up quickly and maintain an even flow of heat as you are using it. Its far infrared heat generation also penetrates deeply into your curly hair strands to allow you to reshape them as you desire. 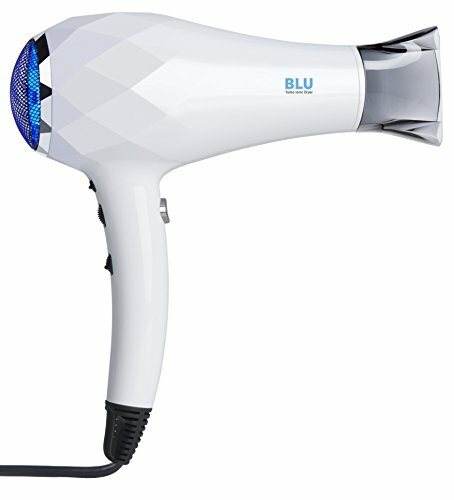 Here is an innovative hair dryer that works great on curly hair. It’s the InStyler BLU Turbo Ionic Dryer which has many special features that will allow you to dry and reshape your sometimes stubborn curly hair. Chief among these features is its high heat generating 1500 watts of power. Also built into it to help with drying and styling your curly hair are technologies such as ceramic/tourmaline heater coatings and its high powered fan motor. 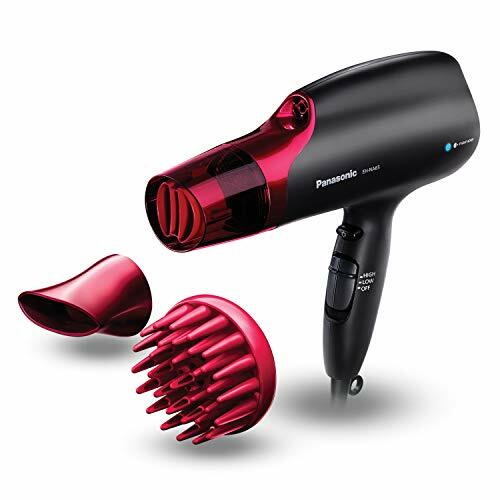 Ceramic/tourmaline heater coatings help this hair dryer maintain even heat while also helping to keep your hair as moist and pliable as possible as you style it. Its high air flow of 1500 liters per hour allows you pinpoint accuracy in directing its heat exactly where you want it. It also has a special dial control for its airflow so you determine exactly the airspeed that works best for you on your curly hair. 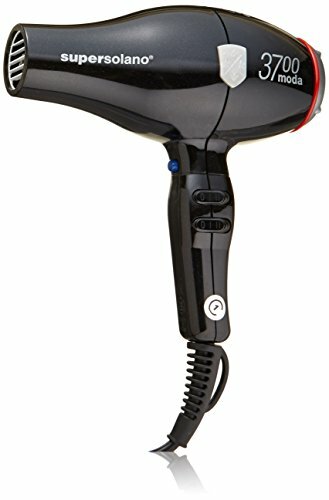 If you want to quickly dry and style your curly hair then there is no better way to do it than with the 2000 watts of heating and air power this hair dryer has. The Panasonic EH-NA65-K Nanoe Hair Dryer is truly an effective weapon to have your arsenal when it comes to reshaping and drying curly hair. The excellent curly hair drying and styling features with this hair dryer do not start and end with its power either. It also has such nice features as progressive Nanotechnology and a very effective cool shot button. Nanotechnology helps your curly hair stay supple by allowing it to keep a large majority of its moisture during the blow drying process. Cool shot buttons are effective at giving your newly reshaped curly hair a blast of cold air to help it stay in place longer after you style it. 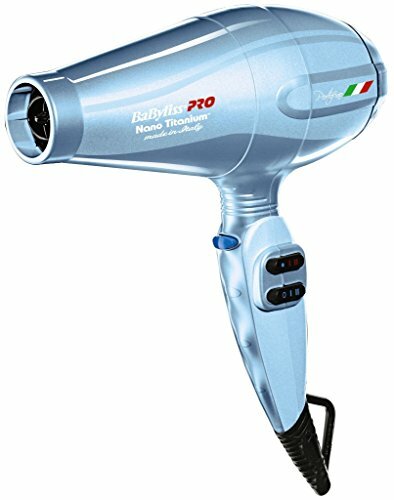 Here is yet another 2000 watt powered hair dryer that can really produce some great airflow and high heat. That helps make the BaBylissPRO Nano Titanium Portofino Full-Size Dryer very effective when it is used to dry or style curly hair. You will find few hair dryers that are loaded with as many nice features that are great for quickly drying and styling curly hair. 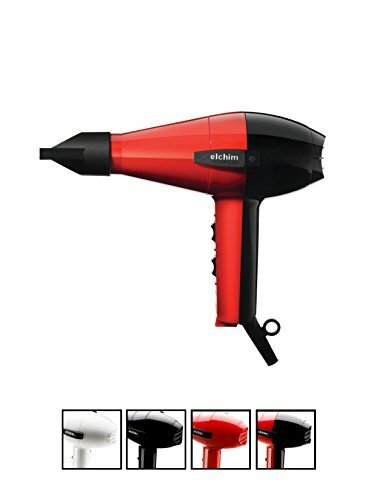 Besides its high heat and airflow, this hair dryer is also known for such things as its state of the art Nanotechnology and multiple air and heat combinations. In order to be able to style curly hair, it must retain its moisture and that is exactly what Nanotechnology in a hair dryer accomplishes. Multiple heat and air settings allow you to customize the heat and air flow to exactly where it works best for your curly hair. Here is a very effective hair dryer from RUSK Engineering that more than adequately is up to the task of drying and controlling curly hair. It features 1900 watts of heating and air power which tends to make curly hair dry quicker and become easier to manage as you style it. That is only the tip of the iceberg though as far as the great features on this hair dryer that makes it effective in dealing with curly hair. It also has far infrared heat which penetrates deeply into curly hair to help gently dry it and keep it from getting airspeed and split ends. There is also built-in titanium/ceramic heater technology and tourmaline crystal infusion. These all combine to produce heat quickly, disperse that heat evenly and heat and style curly hair without badly drying it out in the process. The seven heat and air combinations also help personalize the hair drying experience to the particular type of curly hair that is being dried at the time. Your hair may seem like a simple part of your body but it’s anything but that. 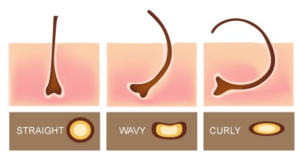 Each hair on your body is made up of a complex series of bonds that hold it together and also give it the straight or curly appearance it has. Hair becomes curly when it tunnels into the scalp at an angle and that force the strands of hair closer together in the process. The overlapping strands of hair and other factors join the chemical bonds together too and this increased pressure on the ends of the hair strands causes them to curl even more. Curly hair tends to have thicker and stronger hydrogen and disulfide bonds than straight hair does. This is what makes curly hair more difficult to dry and reshape. Excessive moisture and high heat are the best ways to break these strong bonds that curly hair possesses so you can then style it easier. That is what makes it so important for any person that has curly hair to own a hair dryer that generates very high heat. Since blow drying removes moisture from the hair the high heat then becomes the only way to break up the hydrogen and disulfide bonds that are then left in your curly hair. Once the heat breaks these remaining bonds it then allows you to style your curly hair more easily. We all know by now that this is the most effective way to get curly hair to dry quickly and cooperate when you go to style it. It is absolutely critical that any hair dryer mode you buy to use on curly hair be adequately powered. Anything less than 1400 watts will probably not do the trick. You not only need high heat to dry and style curly hair but you need to be able to push that heat exactly where it’s needed. That is what superior air flow does to help with curly hair styling and drying. Once again a hair dryer that can generate over 1400 watts with its motor usually produces very good airflow too. 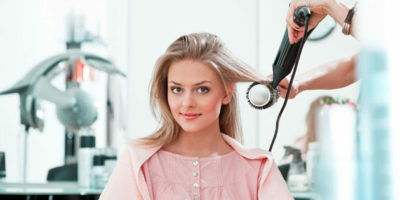 Titanium heater coatings work superb at helping any hair dryer heat up quickly. This saves waiting time to work when you want to blow dry and style any type of hair including curly hair. So if you can find a hair dryer that has this type of heater coating it will definitely reduce your time in the bathroom getting your curly hair ready in the morning. When you have an object that requires heat to make it pliable you can move it easier with steady even heat than you can with intermittent waves of heat. That is exactly what ceramic heater coatings accomplish in a hair dryer. They allow you to style your hair easier because the strands get an even and steady flow of heat to them because of this technology. This type of technology goes a long way to help prevent curly hair damage when blow drying it and styling it. It helps hair retain more moisture during this process because less heat is required to dry each strand of curly hair. This newer dryer technology also helps curly hair maintain its healthy shine and it goes a long way toward preventing split ends and frizz too. There is a reason why people like to style their curly hair when it’s wet and that’s because moisture makes it easier to manage. That is the very same philosophy that hair dryers which include Nanotechnology use. There is no better way to keep curly moist than with state of the art Nanotechnology. This technology breaks down large water molecules into extremely small particles which dry quickly and also penetrate back into the strands of curly hair too. 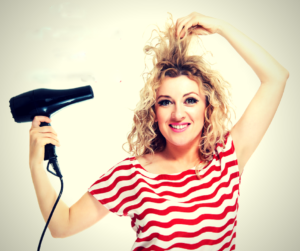 Just because curly hair is tougher to dry and style does not mean you can just overpower it with a hair dryer. Even curly hair can be damaged if you don’t dry and style it the correct way. Far infrared heat is an effective and gentle way to dry and style any type of hair including curly hair. It accomplishes this by heating curly hair up from the inside out which is much healthier for it than heating the hair strands up from the outside in. Drying and styling hair has never been and never will be a one size fits all process when it comes to curly hair. Everyone’s hair type is slightly different in nature. That is why being able to slightly customize your heat and airflow settings are so critical when drying and styling curly hair.Because of that, you will need to look for a hair dryer that has multiple speed and airflow settings. At the very least you want to have the choice between 2 heat settings and 2 airspeed settings. Most well-made hair dryers will have at least 3 heat settings which most salon professionals would consider ideal. The ability to put extra heat in a pinpoint location is very effective when dealing with curly hair types. That is where a nice hair concentrator attachment comes into play. If you can find a hair dryer that includes these right in the package that will be a very nice little bonus for you. If you purchase an inexpensive hair dryer that you can purchase them separately for that is not altogether bad either. If you have been around hair dryers long enough you have probably realized by now that they sometimes come with attachments. The most popular of which are called concentrators and diffusers. It is the use of diffusers that most people don’t understand, especially those that have curly hair. Start the hair drying diffuser process on the lower heat and air settings and work your way up to the settings that are effective on your curly hair. That way you will avoid damaging it. Turn your head to the side or let your hail fall upside down in order for your diffuser to work better on it. Don’t just work the ends of your curly hair. Moving the diffuser closer to your scalp will help the drying process and help keep your curls more natural. It’s better to diffuse your hair in large sections rather than concentrating on smaller areas at one time. You will get much better-looking results this way. Don’t interfere with the natural clumping and curling process. This will definitely hurt the results of the finished look you get after using the diffuser. By all means, learn how to use a diffuser to help your hair look better and maintain its healthy look after you dry it. Question: Is it ok to skip the shampoo and just use conditioner on my naturally curly hair? Answer: The answer to this question is yes with an asterisk. That is because shampooing your curly hair with the right type of shampoo is excellent for it. Salon style brands tend to have less salt and fillers which tend to hurt your curly hair. Some people, on the other hand, get very favorable results just using conditioner on their hair so it’s hard to argue against it. If you use just conditioner and it leaves your curly hair shiny, soft and without split ends or frizz, then what you are doing certainly is not hurting your curly hair any. Question: is there any way to help the curl in your hair become tighter? Answer: Yes there is. Many professionals accomplish this by cutting of the damaged and over dried ends of their client’s hair. This, in essence, is like removing dead weight from your curly hair and it will allow your curls to tighten and get springy again. Question: Is occasional straightening going to hurt my natural curly hair? Answer: Most likely yes unless you take great pains to avoid damaging your hair in the straightening process. There is no such thing as truly straight hair so straightening it is an unnatural process. The most common method of straightening is with a flat iron and we are talking very high heat here which is never a good thing as far as any type of hair is concerned let alone curly hair. Using some natural oils or other professional hair coatings may help minimize the heat damage caused by straightening and allow you to do it occasionally without significantly damaging your curly hair. If you have curly hair owning the right hair dryer is an absolute must if you want to dry it and style it quickly and easily. There simply is no way around this fact. 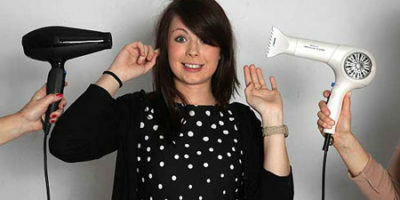 We have discussed some features that any hair dryer you buy to use on your curly are nice to have. As the saying goes ‘the more the merrier’. 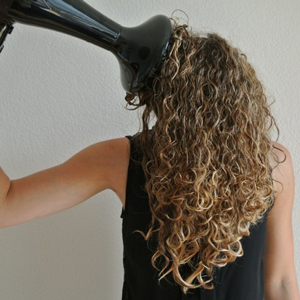 It’s very true when it comes to having the best hair dryer for curly hair. You can’t go wrong by choosing any of the curly hair dryers that we reviewed in this article and at the very least you now know what to look for when you are shopping for a new hair dryer to use on your curly hair type.